Professor Chen conducts studies with students and a research associate in the lab. From left, Rekha Gautum, Josh Lamstein, Professor Chen and Chensong Zhang. Fellowship in the American Physical Society is awarded to less than one-half of 1 percent of the society's membership. The distinction -- given for outstanding physics research, important applications of physics, leadership in or service to physics, or significant contributions to physics education -- is awarded to less than one-half of 1 percent of the society's membership. Chen was recognized for "seminal contributions on spatial solitons, photonic lattices and beam shaping, and for promoting world-class research at an undergraduate institution," according to his fellowship citation on the APS website. Since joining SF State in 1998, Chen's research interest and scholarly work has focused on developing fundamental knowledge and innovative techniques in the interdisciplinary fields of nonlinear optics and biophotonics. 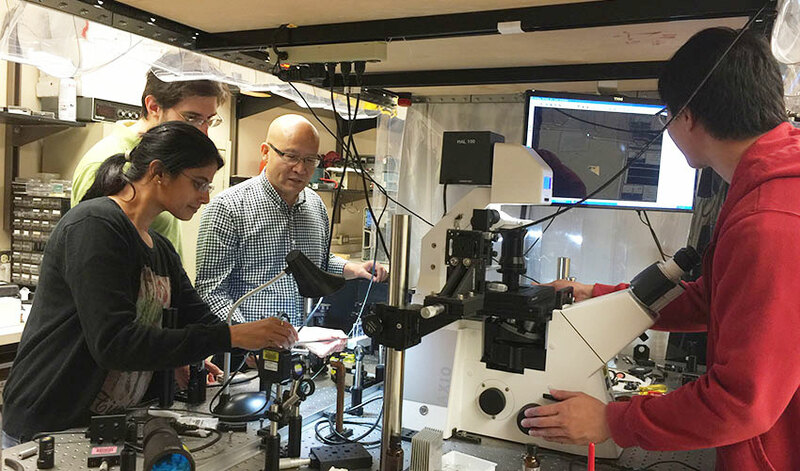 Biophotonics combines biology and the science of optics and photonics. In addition, Chen researches material sciences, with a special focus on engineering optical beams and photonic materials and structures with a variety of applications, ranging from biology to novel nanomaterials. "It's good to be recognized, especially when you are doing all of this at an undergraduate institute," said Chen. "It means a lot for me, since we started the optics research here from scratch, turning it into a world-leading group." Chen has taught general physics, modern physics lab, electromagnetism, modern optics and quantum optics. He has published more than 350 papers in refereed journals and conference proceedings, including in journals such as Science, Science Advance, Nature Materials, Nature Communication and Proceedings of the National Academy of Sciences. He has edited a book and co-authored several invited book chapters. Chen also serves as an editor for a number of scientific journals, including Scientific Reports, Optics Letters (Optical Society of America), Science Bulletin and Advances in Physics: X. His research is funded by the National Institutes of Health, the National Science Foundation, the Air Force Office of Scientific Research and the Army Research Office. Chen is also an elected fellow in the Optical Society of America.